Successfully Added Multimedia Projector with HDMI, VGA, TV, and More to your Shopping Cart. Multimedia Projector with HDMI, VGA and other AV inputs for a full array of business, classroom and home entertainment media viewing. An LCD Multimedia Projector for either productivity (teaching, meetings, etc.) or entertainment uses. The simple to use projector has multiple video input options and projects an image size up to 150 inches. Often used in classrooms, conference rooms, hotel meeting rooms, sports restaurants, or home theaters, LCD projectors are also suited well for any presentations or entertainment venue where large, crisp images will be shown, and a great way to get big screen sizes without the need for the dedicated floorspace. 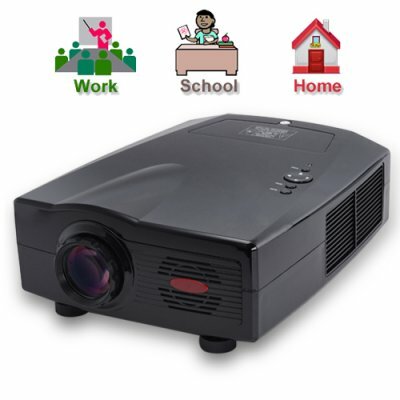 This multimedia projector is equipped with a 800 x 600 native resolution and upscaled resolution up to 1080i meaning this China Wholesale Projector is ideal for both Entertainment and PowerPoint presentations in providing clear, crisp images in a number of settings (office, conference rooms, classrooms, etc.). Using a handy VGA input, this flexible unit is perfect for use with computers, DVD players, gaming consoles, and VCR's. With the perfect combination of an impressive feature set and ease of use, this Multimedia Projector comes with an unbeatable low China Wholesale Price. This LCD multimedia projector is perfect either for the resale market, OEM market, or personal/company use. Brought to you from your source for wholesale direct from China electronic products, Chinavasion. A bit noisy but exellent quality/price,thank all Chinavasion team for your service ! I was pleasantly surprised by this projector when I got it. To be perfectly honest, given it's rather cheap price by comparison, I was expecting less. It is very solid, does not feel cheap at all. It's pretty bright too. I don't think it's usable in a lit room, but I'm not sure why you would use lights with a projector anyways. I picked up some blackout curtains for my room and it's quite nice. I mostly use it with my xbox using hdmi. I have my xbox on 1080p and it hasn't had any problems. The bulb was pretty easy to change as well, once I got the (rather firm) cover off. I only connect video to it, and connect my audio straight to my stereo! TL;DR Its nice, Highly recommended!